Everyone knows that Texas is a big state with a lot to do, because Texans never let anybody forget it! Texans are rightly proud of the state’s diverse landscape—from the Gulf Coast beaches to the Guadalupe Mountains out west to the Palo Duro Canyon in the Panhandle to the Piney Woods of East Texas. And, of course, the diversity of cultures and amenities in cities like Houston, San Antonio, Austin, El Paso, Dallas and Fort Worth draw visitors from all over the world. Although Texas has many natural wonders, some of the best attractions in the state really do depend on electricity. Here are several electrified attractions that no visitor should miss. Built in 1855, Aransas Pass Light Station was one of the first Texas lighthouses in the U.S. Lighthouse Service. The brick lighthouse is built on Harbor Island, just inside the pass. Originally the lighthouse used burning oil to illuminate the lens. It was electrified in 1928. 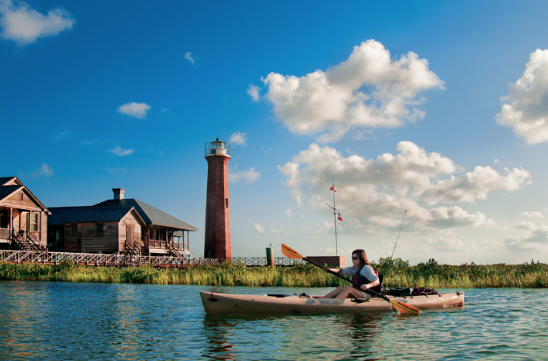 Over the years, the Aransas Pass continually shifted until it was almost a mile away from the original lighthouse. In 1952, a new lighthouse was built closer to the channel and the Lydia Ann (which it was now known as, since it was closer to the Lydia Ann channel) was decommissioned. That could have been the end of the story, except it was sold to a private citizen in 1955. It changed hands several times, but was eventually refurbished and turned back on as a private guide for boats. Now, it’s one of only two working lighthouses on the Texas Gulf Coast, with keepers who live on the grounds who make sure the light shines continually. Howdy folks, and welcome to the great State Fair of Texas! Millions of visitors have been welcomed to the annual State Fair at Dallas’ Fair Park by the booming voice of Big Tex since 1952. Big doesn’t quite do him justice—he’s a 55-foot tall animated cowboy. 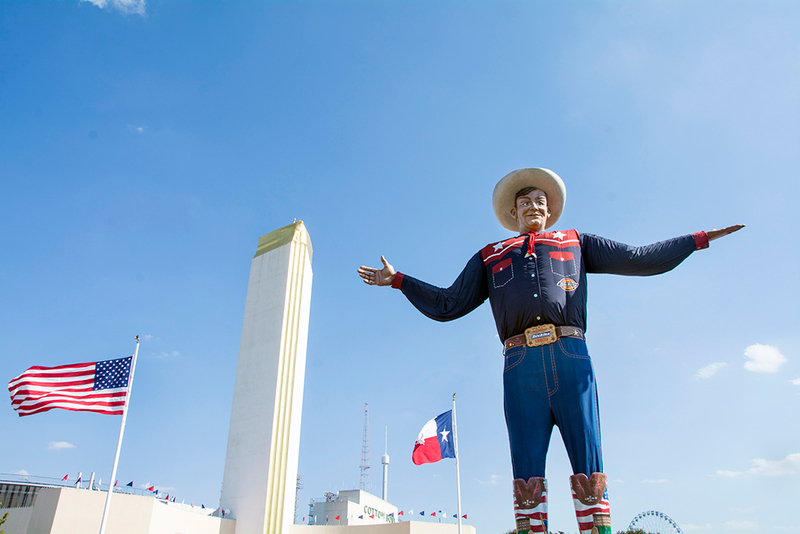 Not only does electricity provide the means for Big Tex’s voice to ring out over the fair and tell visitors about fair events, food specials and all manner of fair attractions, but it also allows him to wave his giant right arm in greeting. Big Tex burned down in an electrical fire in 2012 on his 60th birthday, but was back and better than ever by the next year. You can’t miss him and his 95-gallon hat when you attend the State Fair every fall. For over 30 years, the Fort Worth Parade of Lights has traveled through downtown, lighting up the city along the way. The parade features more than 100 illuminated floats, parade balloons, performance and community groups. The parade is held prior to Thanksgiving and spans 20 city blocks surrounding Sundance Square. 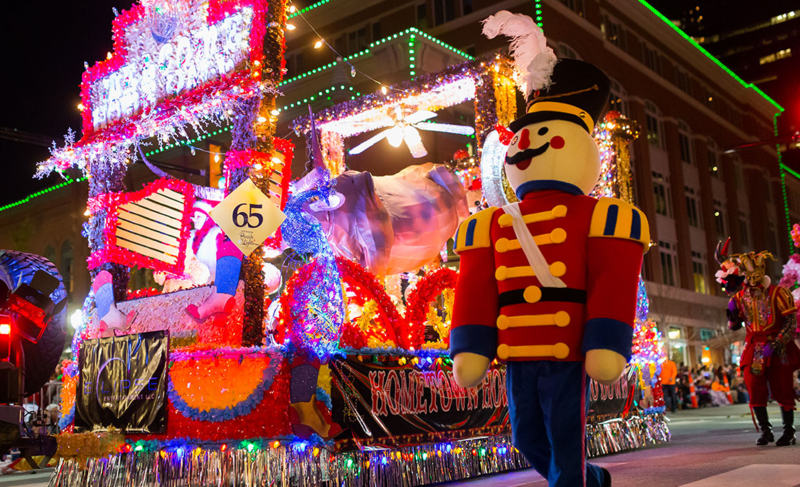 Parade policies require every float to be illuminated, and they require a minimum number of lights for each float size—so you can be sure that every float looks brilliant. And, floats are participating for a number of judged awards, which means every year the participants outdo themselves trying to win. Even people who walk or ride horses around the floats must have lights on them. Johnson City, Texas, is most famous as the home of former U.S. President, Lyndon B. Johnson. It’s in the Texas Hill Country west of Austin, about an hour’s drive by car. LBJ’s birthplace in Stonewall is 15 minutes west of Johnson City, where Texas’ famous and growing wine country dots Highway 290 with vineyards and wineries all the way into Fredericksburg. So, with all those attractions, not to mention deer hunting, the Pedernales River, and the nearby chain of Highland Lakes, it’s no wonder that few visitors know about one of the most special treats in Johnson City. It’s also home base to Pedernales Electric Cooperative (PEC), the nation’s largest rural electric co-op. Each year, starting on the Friday after Thanksgiving, the Blanco County Courthouse in Johnson City is draped with more than 100,000 white Christmas lights for the Lights Spectacular. And, right across the road, PEC lights up all of the ancient live oaks around its campus that takes up a city block as well as the headquarters with more than 1 million white lights! Those don’t include some trees highlighted with colored lights for even more visual impact. 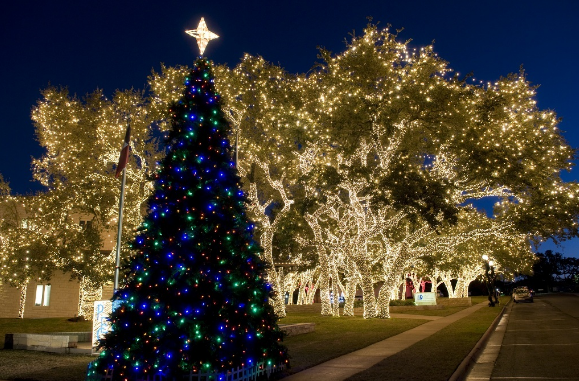 The lights are on through January 1, so make a trip to the Hill Country and enjoy the spectacular sight.